The colored bars in the rows are called time blocks in Tom’s Planner. 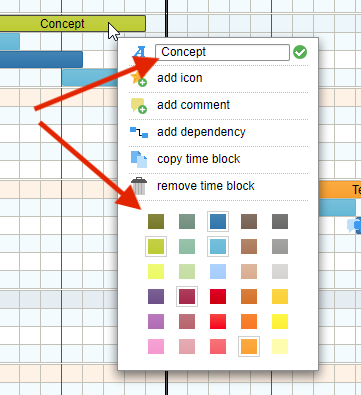 You can add time blocks to your schedule by right clicking on the grid and choosing the option ‘insert time block’. If you already have time blocks listed in your legend you can drag & drop them directly into your schedule. With drag & drop you can change their start time/date (position horizontally in the grid) and the duration (width) of the time block. If you right click a time block you will be offered the option to change the color of your time block and add a label to it. The colors you use will automatically be added to the legend. If you want to move more than one time block at a time you can select multiple time blocks at once by holding the shift key down and clicking the individual time blocks in the grid. You can also select multiple time blocks by dragging your mouse over the grid. If you keep the alt key down on your keyboard when you start dragging a time block (or icon) to another location in the grid the tool will automatically make a copy of the time block you were trying to drag and drag the new time block to the new location.